At its base, branded content features a formula of theme + conflict = call-to-action, which was broken down in detail in our blog on content in the digital space. Understanding this formula and what makes up these types of videos allows one to take the next step in creating one. In order to craft branded video content, the following steps are deemed necessary to ensure all elements of the branded equation are thought out in detail, allowing for maximum effectiveness in the advertisement. The key components to getting started are identifying what the goals of the video are. Understanding whether the client is looking to utilize a video for a specific audience engagement, product promotion, or simply brand outreach, will allow the video to be centralized on one type of outcome in terms of ROI. Knowing this will take us to a call-to-action, or the main take away from the video. For example, if we are making a video about a shoe, we would want the call-to-action to be some statement on where to buy the shoe and when it is available. With the main goal accounted for, we can begin to look at the visual and story elements that will help drive the video toward our call-to-action. A look book is a document that contains images associated with what we will see in the final video. Its overarching purpose is to lend a sense of visual tone, style, the cinematography, art direction, and all other necessary items that will allow us to gauge both what is needed on set for filming, as well as how to develop our lighting schemes. 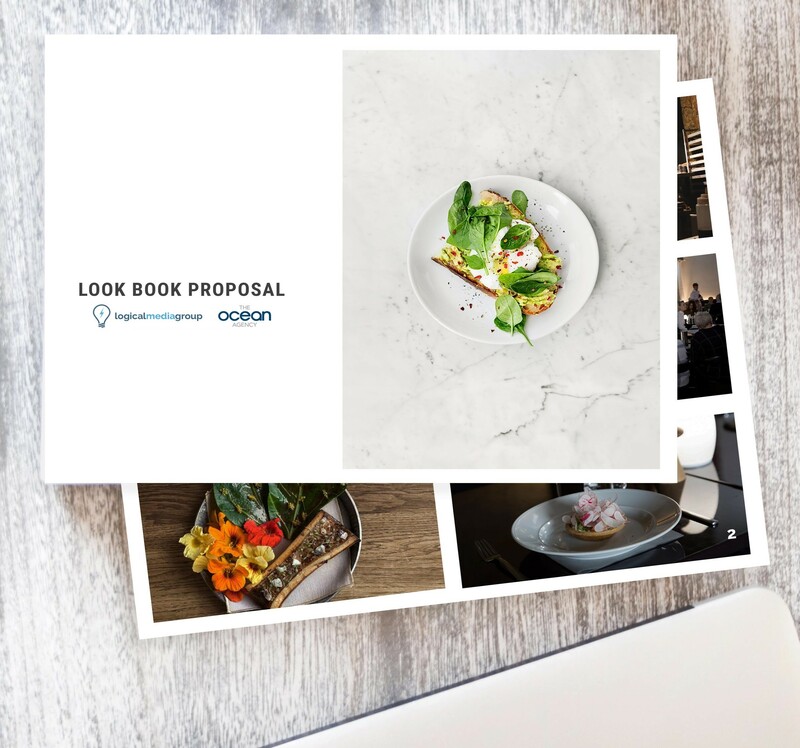 Look books are great for also showing clients the intent of the visuals, giving them something to examine as opposed to simply relying on their imagination to render the vision of the video. In our shoe example, we might want to include images of a basketball player shooting hoops while wearing the product. We may also decide to incorporate different close-ups shots of the sneaker. Additionally, we will want to include pictures of locations that offer similar lighting as to how we want to shoot the final segment. These images can be collected from the internet, or staged and taken from a location scout or pulled from videos with a similar style. The purpose of this document is to be used internally for getting the ball rolling into the next phase, the script. The script is pretty self-explanatory, but its importance cannot be understated. Outlining and drafting a proper script will solve a myriad of potential headaches before walking onto the set. There are two types of scripts one can use, depending on the format being delivered. The AV Script or Audio/Visual Script is most common in Television commercials and Public Service Announcements. When filming smaller subject material, this tends to be a convenient format because it clearly delineates what is occuring with the audio, matched up with what we are seeing with the visuals. What the AV Script lacks, is in the detail. As a general rule of thumb script writing is devoid of prose, only giving the necessary details and action to drive a scene forward. 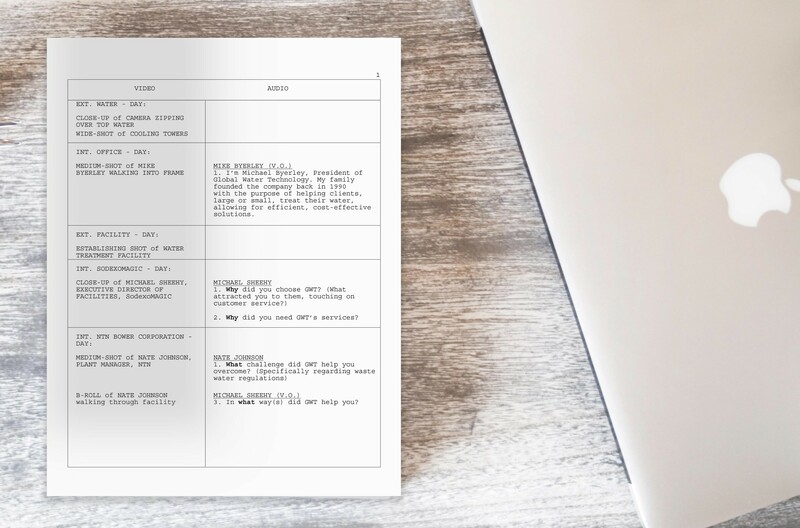 However, a standard script format can be beneficial for longer advertisements or scripted scenarios where dialogue runs a bit lengthy, and action-elements need longer description. Once a format is chosen, it is time to develop what we will eventually film. Keeping our call-to-action in mind, we can focus on the theme. If the goal is to promote sales on the shoe in our example, it might work well to shoe the lifestyle of those who wear it. Athletes, runners, etc could be good subjects to feature, as we know the common themes associated with sports: drive, commitment, passion. In answering the theme, we have also identified a potential conflict: failure…the opposite of all three components listed above. Understanding that theme + conflict = call-to-action, we develop a sample branded video. We take an athlete (the basketball player), full of drive and passion, running down the court. He stops and shoots, but misses as the buzzer fades. They lost. Perhaps he takes the sneakers off and sets them on the bench as he walks away. We can keep the sneakers on the bench and show various footage of the player shooting and missing baskets in practice, but he still refuses to put the sneakers back on, finally setting the ball down and turning off the lights in the gym (conflict). The next day, he enters the gym and begins to find his rhythm, but is just slightly off the mark. He laces the sneakers on his feet and begins hitting every shot. Finally, we cut to the game and he hits the buzzer-beater to win…on his feet are the sneakers. Cut to call-to-action statement on where the shoes are available. With the story completed, we can move into production. In the production phase, we begin filming the content. We will assume we have already scouted our locations, assembled our crew, equipment, and any other props and elements necessary based on what we outlined in the look book and the script. This phase should be the most methodical if proper planning was taken beforehand. We encourage newer filmmakers to read our blog on ten essential items for any production. Returning from the shoot we can begin the edit. Editing can be broken into three main phases, the first being logging the footage. This process entails taking each shot and take, and watching it from beginning to end to identify the good, the bad, and the downright ugly. Marking and selecting which moments of each shot work best, we can move into the assembly edit. The assembly cut is where we begin to align the shots into scenes, and the scenes into order, using the script as a guide. When everything is in place, it is time to polish. 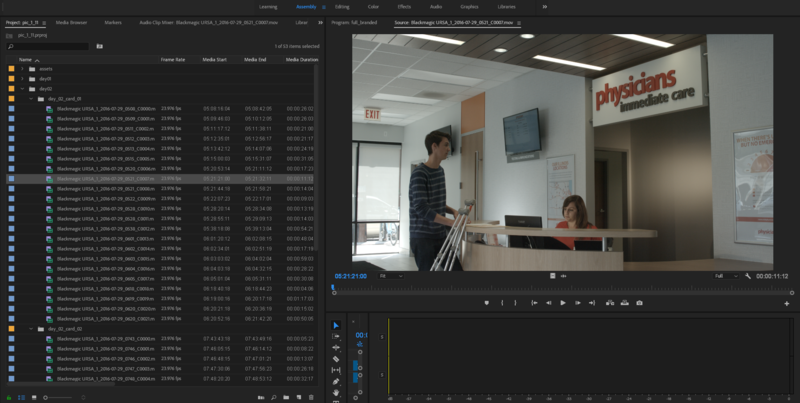 The rough cut is the point in editing where the assembly begins to be trimmed for pacing, adding audio elements, and overall guiding the cut into a more finalized product. At Logical Media Group, we typically go through two rounds of revisions on the rough cut to ensure it arrives at a concise final cut. Before the edit it locked, we will do a pass in color grading, which we wrote a blog on here. Once picture is completed, we finalize the audio mix, bringing in music and adjusting the levels of each cue to ensure quality listening. Once completed, the edit may differ slightly from the original idea outlined in the script, but that is okay so long as the completed product aligns with the original goals established in the first phase. The great thing about this process is that it addresses all the proper components to reinforce a quality finished product, because each step is being thought about in detail, and how it relates back to the goal of the client.